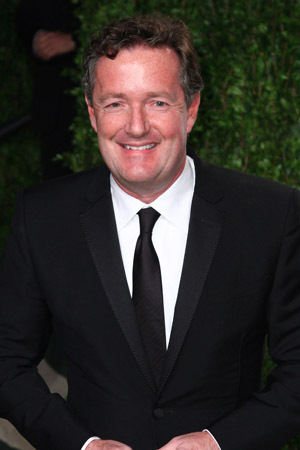 Piers Morgan stood behind former Growing Pains star Kirk Cameron when he made anti-gay comments on his CNN talk show. Now, the British host is criticizing Cameron after he made more inflammatory comments on Tuesday morning. Outspoken CNN talk show host Piers Morgan might not have agreed with the anti-gay comments Kirk Cameron made on his show, but he defended his right to say them. Now, Morgan is blasting the evangelical Christian actor for comments he made on Fox & Friends Tuesday morning. Specifically, Morgan took issue with Cameron for criticizing his line of questioning. “What disheartens me… is that when you’re sitting across the table from someone who knows what your perspective is on issues — and I’ve been very consistent, I don’t think anything I said surprised anybody as a Bible-believing Christian — but to then take some answers, reduce an important and personal and sensitive issue to a four-second soundbite and toss it into a community to start a political firestorm and really upset people that you’re saying you’re looking to protect, I think it’s disingenuous,” he told the Fox hosts, adding that the interview was only supposed to be about his new movie, Monumental. Uh, has he ever seen Morgan in action? Obviously not — the former British tabloid editor is always going to hit on controversial subjects. Scandal equals publicity for Morgan, so he fanned the flames on Twitter. “Kirk Cameron is moaning everywhere today that I stitched him up by releasing a 4-second ‘soundbite’ re his comments on gay marriage…” he tweeted late Tuesday morning. Cameron should be pretty used to the criticism these days — many in Hollywood have criticized his comments on homosexuality, including his former co-stars Alan Thicke and Tracey Gold. The only celeb to publicly stick behind him is born-again Christian actor Stephen Baldwin. Something tells us that the war of words isn’t over yet. Where do you stand: Team Piers Morgan or Team Kirk Cameron?